Home| Technical| What is PB-1? Polybutene-1 is a polyolefin manufactured utilising Zeigler-Natta type catalysts which produce a highly isotactic thermoplastic with superior mechanical, thermal and chemical resistance properties making it the technically preferred material for the production of pressurised hot and cold water piping systems. Polybutene-1 is a member of the polyolefin family of thermoplastic materials which also includes polyethylene and polypropylene. Polybutene exists in two isomeric forms depending on where the carbon double bond is positioned in the monomer molecule. If it is between the first and second carbon atoms in a linear molecule (Butene-1), then the chemically accurate name of the resulting polymer is 'Polybutene-1' (PB-1). If it is a branched monomer molecule then the resulting polymer is called Polyisobutylene (PIB). The polymer PBPSA members use is Polybutene-1. In the past this polymer has been referred to as polybutylene, PB, PB-1 and polybutene, as well as its correct chemical name, Polybutene-1. The PB-1 raw material grades are manufactured in the world's largest polybutene manufacturing plant in The Netherlands. The balance of properties of Polybutene-1 make it the technically preferred material for the production of pressurised hot and cold water piping systems. In chemical structure Polybutene-1 differs from polyethylene and polypropylene only by the number of carbon atoms in the monomer molecule. PB-1 is manufactured utilising Zeigler-Natta type catalysts which produce a highly isotactic thermoplastic. A unique crystalline structure, combined with carefully controlled molecular parameters give Polybutene-1 a combination of properties ideally suited to applications requiring both high strength and flexibility at temperatures up to 100°C. As an essentially 'pure' highly isotactic homopolymer, Polybutene-1 is more easily specified to consistently achieve quality performance. The properties of PB-1 can be tailored by copolymerisation with PE or PP to create random copolymers suitable for special applications in underfloor heating. PB-1 has a density similar to water of 0.92 gm/cc. Polybutene-1 can be processed via standard injection moulding or extrusion into a broad range of pipes and fittings for hot and cold pressurised water systems. In its most simple homopolymer form, the balance of properties of PB-1 make it the technically preferred material for the production of pressurised hot and cold water piping systems. 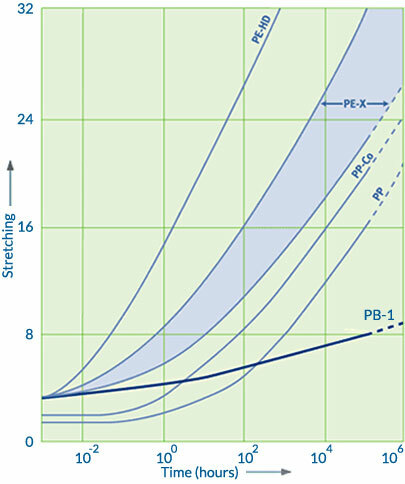 In contrast to other thermoplastics used in these applications, performance modification via compounding, cross-linking or copolymerisation is not necessary for PB-1 piping systems to fulfill the stringent performance standards applied to their use. In comparison with other polyolefin materials, PB-1 has a higher level of resistance to strain under continually applied stress over long periods of time. This is known as creep behaviour and the graph illustrates the increasingly superior performance of PB-1 at times in excess of 100 hours. In addition to its superior mechanical and thermal properties, PB-1 provides a high level of resistance to chemical attack and also meets a level of flammability resistance meeting the demands of most applications.